The mission of the Iowa Games is to provide sports and recreation opportunities for all Iowans through Olympic-style festivals, events and programs. The Iowa Games offers statewide sports competition for Iowa’s athletes. The Iowa Games was first introduced to the state in 1987 when the Summer Iowa Games was held in Ames. Today, over 13,000 athletes participate in 60+ sports at the Olympic-style sports festival during July. In 1992 the Games expanded to include the Winter Iowa Games in Dubuque and Cedar Rapids. In late January and early February over 4,000 Iowans compete in 20+ sports. All Iowans! The Iowa Games offers events for athletes of all ages and abilities! Residency Policy Update: The National Congress of State Games, the membership organization of the Iowa Games, has recently amended its residency requirement to allow non-resident participation in State Games events by residents of states that have no State Games program and residents of states whose State Games program does not offer their sport of choice. 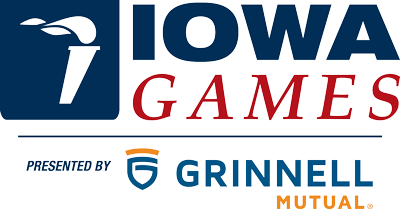 The Iowa Games, in order to foster State Games interest in non-member states, has agreed to allow non-resident participation. If questions please email info@iowagames.org. We encourage everyone to register online. You can register for a sport by going to our Sport Listing, selecting a sport and following the online registration process. There is also a printable entry form on each sport page which you can fill out and mail with payment to the Iowa Games office. All individuals and team participants will receive an Iowa Games T-shirt with registration. Coaches shirts are optional and cost $5.00. WHERE DO I PICK-UP MY T-SHIRT? Summer Iowa Games T-shirt pick-up and information booth are located inside the Sukup South Endzone at Jack Trace Stadium for all main weekend sports. For first and final weekend sports T-shirts will be distributed at the competition site. Winter Iowa Games and other events, T-shirt pick-up will take place at the venue. IS THERE AN ADMISSION FEE FOR SPECTATORS? All Iowa Games events, other than Net Fest Basketball and Summer Iowa Games Track & Field, have free admission for athletes and spectators! WHAT IF I WANT TO ENTER MULTIPLE SPORTS? Athletes are discouraged from entering more than one sport due to various competition formats and the possibility of overlapping schedules. Athletes who enter more than one sport do so at their own risk. No refunds or schedule changes will be made to accommodate multi-sport athletes. In keeping with the Olympic-style feel, athletes in the all competitive events vie for the custom cast Iowa Games gold, silver and bronze medals with Olympic-style neck ribbons. Sports using outdoor sites are weather dependent. Competition will be conducted unless the sport commissioner, facility managers or the Iowa Games staff determine weather conditions to be potentially dangerous or life-threatening, or if playing fields would incur significant damage. The Iowa Games reserves all rights to change competition format, schedules or locations depending upon the situation. There will be no refunds for events canceled due to weather. For more information on the Iowa Games refund policy please visit the web page listed under the About tab. The Iowa Games is a non-profit organization that relies heavily on its volunteers. For many of our volunteers, it is the feeling of accomplishment, sharing in others’ success or just having fun that keeps them returning year after year. CLICK HERE to learn more about our opportunities. CAN THE PHYSICALLY DISABLED COMPETE? The Iowa Games offers certain divisions for the physically disabled athlete. Please visit the Adaptive Sports Iowa web page for more information on events and clinics offered for the physically disabled athlete.